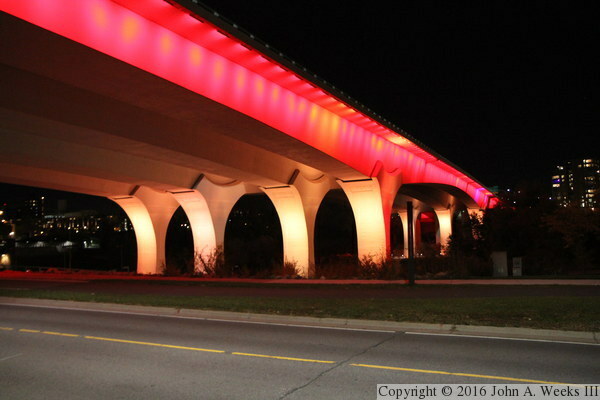 The new I-35W Saint Anthony Falls Bridge features an innovative LED lighting system where each LED element is individually addressable, allowing any color in the spectrum to be displayed. On most nights, the bridge is bathed in a eerie blue glow that looks like something out of a science fiction movie. 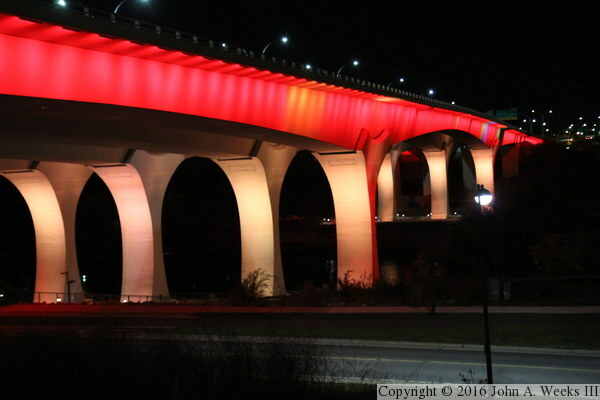 However, the bridge is occassionaly lit up in other colors for special occasions. Rotary International has been involved in the eradication of polio since 1985. Polio cases have dropped by 99% since that time, but there are still a few hot spots in Afghanistan and Pakistan. It is hoped that polio will soon be completely gone, only the second disease other than smallpox to have been completely eliminated. 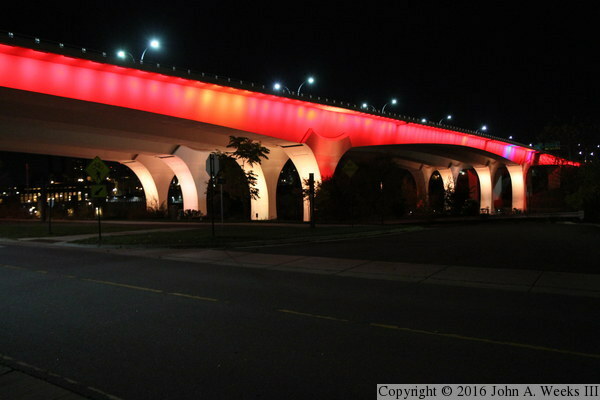 In support of the Rotary Club efforts, the Minneapolis City Council declared October 24, 2015 to be World Polio Day, which was marked by lighting the I-35W bridge in the End Polio Now colors of red and yellow. The photo above is the downstream east face of the Saint Anthony Falls Bridge as seen from West River Parkway, the road that runs along the west bank of the Mississippi River. Note—these materials are covered by copyright and may not be used without written permission. The photo above is the downstream east face of the Saint Anthony Falls Bridge as seen from the south riverbank. 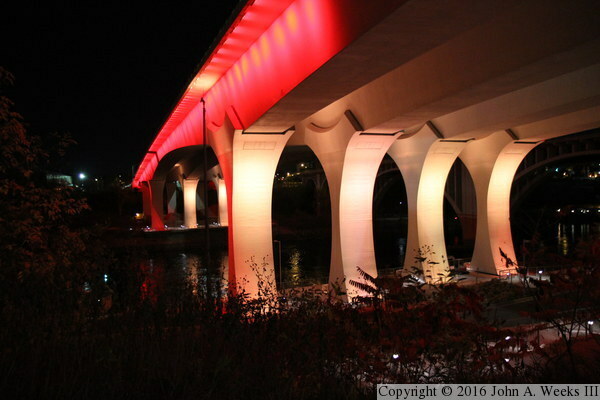 The vantage point is standing near the south main bridge pier of the nearby 10th Avenue Bridge, located just downstream of the I-35W bridge. Note that there are a few light segments that are not working on the north side of the river, and a few that are showing the wrong color. These sections have been malfunctioning for several years. They will eventually be fixed, but probably as part of a larger maintenance project due to the logistics in gaining access to those areas. This view of the downstream east face of the I-35W Saint Anthony Falls Bridge is taken from the sidewalk on the far side of West River Parkway, looking northeast across the Mississippi River. This photo is a saddle connection at the top of a main bridge pier on the south side of the river. The saddle feature is cosmetic. The doors allow access behind the concrete facade to the bearings located at the top of each bridge pier. 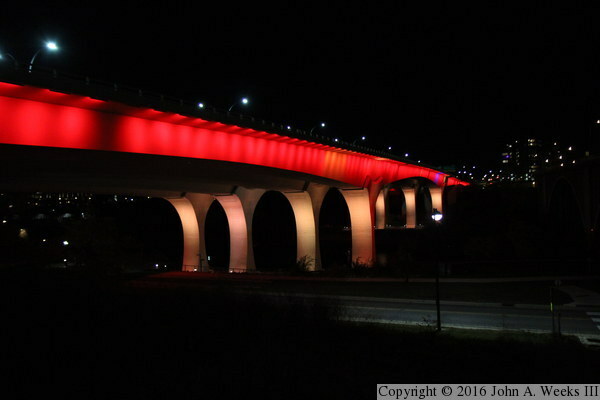 The red color is projected from just under the edge of the bridge deck, while the yellow color is projected upward from the base of the bridge piers. 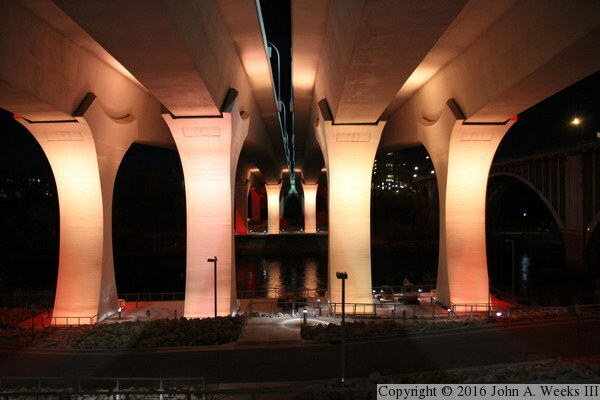 This photo is looking north across the Mississippi River from directly below the I-35W Bridge. The vantage point is the bicycle path on West River Parkway. 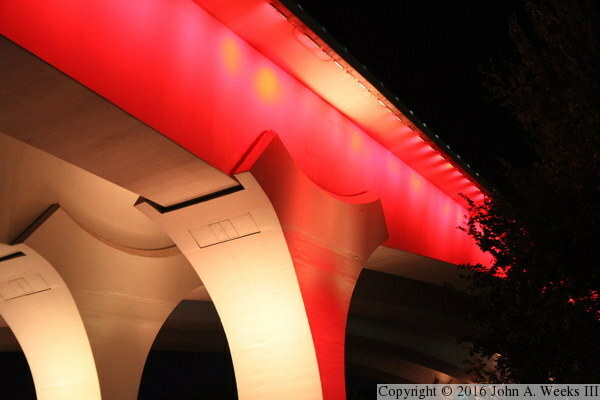 The I-35W Bridge is actually two parallel spans with a small gap located between the two structures. There is an observation deck under each set of main bridge piers, but only the south observation deck (in the foreground) is open to the public. This view is looking across the Mississippi River channel, with two of the south main bridge piers in the foreground and the north main bridge piers on the far side of the river. Light shining down from above creates some interesting visual effects, especially between the two parallel spans. This is the base of one of the main bridge piers on the south side of the river. 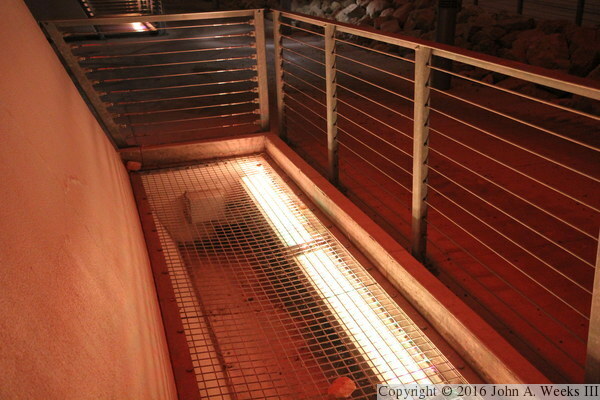 This is actually a drain basin, but it also houses an LED lighting fixture that illuminates one side of this bridge pier. This is another view of the lighting fixture seen in the photo above, but with a very fast shutter speed. This allows us to see the individual LED light elements. 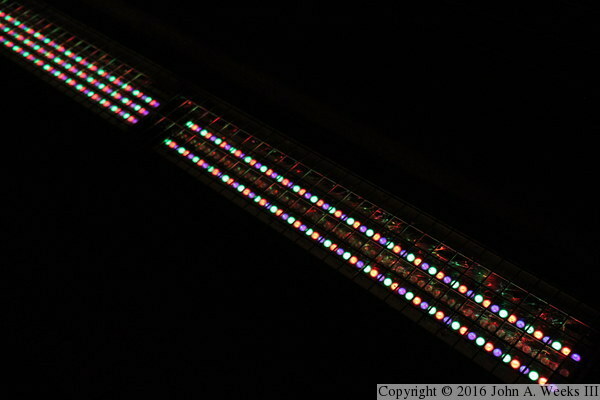 They are arranged in 3 rows, with the lights arranged in a repeating pattern of blue, red, and green. Since light is additive, these 3 primary colors can create any color in the spectrum. Note that one row of lights is not functioning in the section on the right side of the photo. 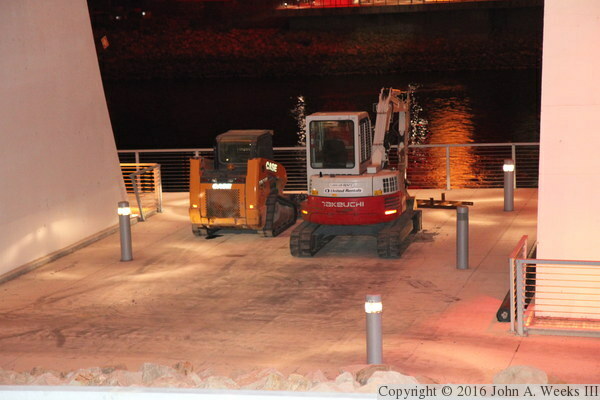 Two small pieces of construction equipment were sitting on the south observation deck on the night of this light display. They were there as part of a project that appeared to be related to a storm sewer outlet located just downstream of the bridge. This is a view of the upstream west face of the I-35W bridge, as seen from the bluffs along the south bank of the river just above the Lower Saint Anthony Falls Lock & Dam. The upstream face of the bridge has been lit in blue during recent light displays since this side of the bridge is visible from the Memorial Garden that honors the victims of the collapse of the previous I-35W bridge. 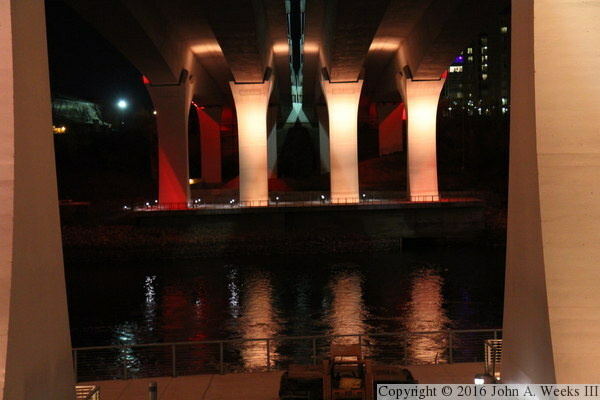 However, on this occasion, the upstream side was lit up in red and yellow as part of the event. 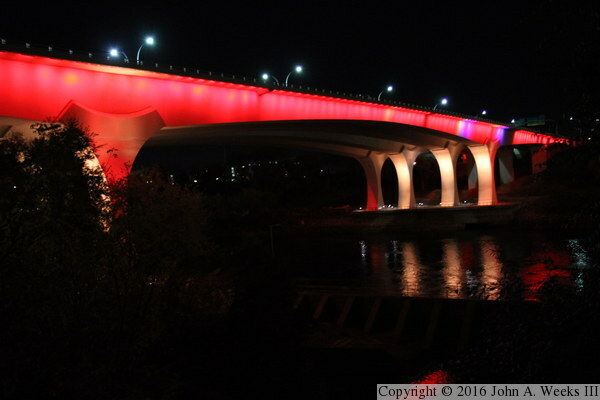 These two photos are views of I-35W Saint Anthony Falls Bridge as seen from the river bluffs on the south side of the river. The photo above is taken from near the south bridge abutment. The photo below is a slightly wider and closer view of the main bridge span over the Mississippi River.